New Year always brings with it a deep seated need in me to rearrange and reorganise the house. I know Ant will now have a sinking feeling in his stomach after reading that because he dreads those words but it has to be done I’m afraid! I’ve ordered Aiden a new wardrobe and I’ve also ordered two DVD shelf units from Very to accommodate our growing DVD collection. The bookcases we are using at the moment are most likely going to go into Aiden’s room as the white bookcase he has in there is broken. 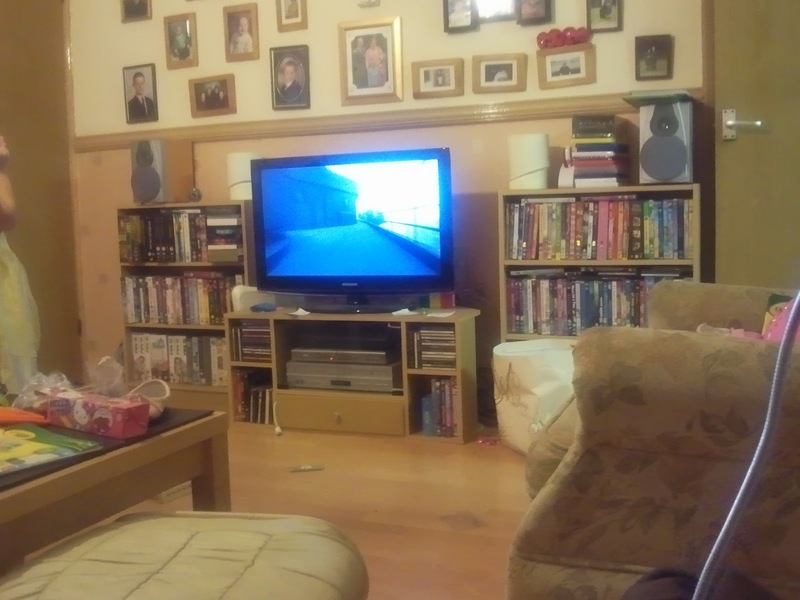 As you can see, the new DVDs the kids had for Christmas are piled on top of the shelves because we’ve run out of room. I’m sending Aiden’s canvas Spongebob wardrobe to my sister’s for one of her boys. It was fine when Aiden was younger and all his clothes were small but now he’s getting bigger, it’s useless. His clothes won’t all fit in the hanging shelves and it’s been used as a place to store all his board games for the last couple of years. His clothes have been on the bottom two shelves of his bookcase, which isn’t a very good place for them either so I decided I’d had enough and he was having a proper wardrobe. I want to give his room a new coat of paint to freshen it up and I’m looking at getting him a throw for his bed because he just can’t seem to keep duvet covers on the duvet! He asked if it could be painted because he said he’s too old for Spongebob now! The girls are going to have new bunk beds and a wardrobe each and I also want to repaint their room. It’s been about 3 years since we last decorated it and it’s looking a bit grubby now. They currently each have their clothes in a 3 tier toy storage unit that we bought from Argos but they’re getting a bit small now. 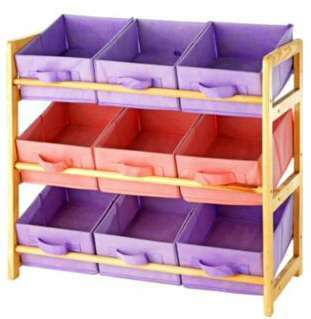 I’m going to use these for their toys, along with the other unit they have that’s similar and hopefully that will provide enough toy storage for everything they got for Christmas. I’m not doing a themed room when I decorate this time because it costs a fortune. We’re just having pink walls and maybe some butterfly stickers or something. I’m going to get new tab top curtains and a curtain pole because I’m sick of the curtain hooks coming off and them looking messy all the time. I’ve also decided to get them pink canvas furniture for their room. They’ll love it more than a wooden wardrobe and as it’s cheaper I’ll be able to afford other units so they’ll have more storage. I’ve just seen a half price offer in Argos for a pink canvas wardrobe set but obviously it’s out of stock everywhere! I hope it comes back in stock before the offer finishes but knowing my luck it won’t! So the plan of action for today is to dismantle Aiden’s Spongebob wardrobe, empty his bookcase and sort all his stuff out. I’m also going to take the princess tent down in the girl’s room and sort their clothes out. I need to get the toys put away so I might put the girl’s clothes in our room until we get the new furniture. Granddad’s taking me to B&M so I can price up the curtains, pole and paint for each room and hopefully I’ll find out from Very when the new DVD shelves are going to be delivered. They arrived at the Lincoln depot on the 31st Dec so hopefully I won’t have to wait too much longer.